Let’s Face It! We want to look our best at any age—not over-filled and over-stretched, just natural. We want to age gracefully, beautifully and elegantly. Inevitably, fine lines and wrinkles set in, and now there is a simple, minimally-invasive treatment that will address those concerns and have you out to dinner that same night. Is The Vivace Experience Right for Me? It’s the newest generation of radio frequency microneedling, and The Vivace is FDA-cleared for your safety. This minimally-invasive treatment stimulates the natural production of collagen and is shown to be effective in alleviating facial wrinkles, fine lines, and tightening and toning the face, neck, hands, and body. We start with the most revolutionary, best-in-class Vivace Microneedling RF device, designed for an incomparable, comfortable patient experience. Only The Vivace boasts a precision robotic motor that brings discomfort to a virtual zero compared to any other device you will find in your physician’s office. We recommend a personally compounded numbing cream, the best available today, and our carefully developed recovery system ensures no one knows you just had a treatment today. The results are immediate and also improve over time, giving you the best of both worlds. Physicians may choose to supplement the treatment with the newest breakthroughs in numbing cream, treatment serums and recovery care to create an optimal patient experience that might just keep you from investigating other more invasive procedures down the road. 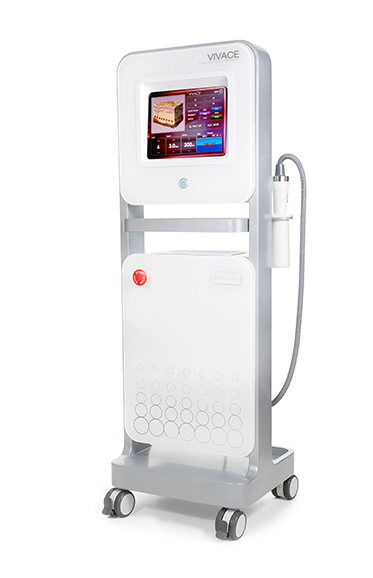 The Vivace Experience™ provides the most dramatic results with virtually no pain and no social downtime. The results are both immediate and improve over time with multiple treatments. With results you can see, you’ll look and feel your best at any age. The innovators at Aesthetics Biomedical are dedicated to providing the best patient experience utilizing the best-in-class device that does it right the first time, and delivers results you can trust and share with others. Learn more at Aesthetics Biomedical.